Raphael Soyer and his twin brother Moses are considered two of the most important American figurative artists of the 20th century. They were born on Christmas Day, 1899, in Borisglebsk, Russia. They immigrated with their family to the United States in 1912, eventually settling in New York City. Raphael studied at the Cooper Union Art School, National Academy of Design, and at the Art Students League with G. P. Dubois. Although the two brothers kept their careers quite separate, they painted similar subjects in similar styles. During the Great Depression, both brothers were commissioned to paint a number of murals for the W. P. A. Raphael was also a prolific printmaker and left a large body of etchings and lithographs. This watercolor by Raphael Soyer was done on one of his trips to Europe in the 1960s. 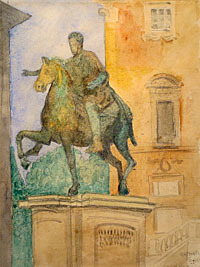 It depicts the equestrian statue of Marcus Aurelius, the last of the five great emperors who reigned during the Golden Age of the Roman Empire. The statue, which dates from 175 A. D., was saved from destruction during the Christianization of Rome because it was mistakenly thought to be of the Christian Emperor Constantine.